Prior to opening Mott Hall Bridges Academy, while serving as an assistant principal, a fight broke out between two young ladies after they had a dispute on AOL’s “AIM” messenger service. The violence that erupted stemmed from cyberbullying that resulted in a lacerated ligament in my neck after being thrown into a brick wall of a staircase in the school. Although this was a painful experience, it was a wake up call that made me realize how significant it would be to integrate social media etiquette and social-emotional support into our curriculum. Knowing that lack of compassion, poor interpersonal skills, and low self-esteem can manifest in negative interactions online, this was the reason why our school focused on creating a culture that encourages our scholars to be respectful, value privacy and safety, work in collaboration with others, being accepting of others ideas, as well as their unique qualities and differences. By using content that already exists online, our scholars are taught to critically analyze what they see and develop an understanding of how their personal information can be stored forever and used as a character reference in the future. We teach our scholars that each space they occupy, there are ground rules for engagement. They learn that digital platforms serve as a powerful tool that can be used to unite or divide, as well as share information that can empower others to take action or learn something new. Not only do we educate our scholars, we also host parent workshops on digital citizenship with a focus on cyberbullying, the digital footprint, privacy and safety protocols online, and engagement. In addition, I also send out periodic letters to strongly encourage parents to closely monitor their scholars interactions and communicate any concerns they may have. Cultivating the civic and moral responsibility of our scholars teaches them the importance of treating others respectfully and improving their community, which must be integral part of building citizenship in all schools. This becomes a foundation that is applicable to digital platforms and sets the expectations of how they must navigate online. But far beyond just telling scholars how they need to behave, they must be given opportunities to practice civic-mindedness. They learn to develop compassion and acceptance for others through many of the project-based activities assigned that requires them to conduct research pertaining to social justice issues, learning about geography and culture, and other content related to information. 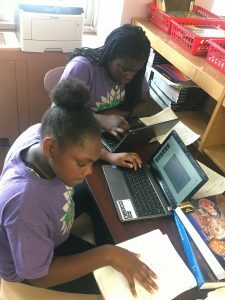 Using Google Docs allows scholars to craft and share their documents or communicate through email to share ideas of receive feedback from teachers or classmates. This not only serves as a way of monitoring scholars’ interactions, but also reinforces their purpose and how they should use digital platforms. My personal experience is the reason why citizenship is a priority in in our school. Digital citizenship is simply a reflection of how we treat each other in society. When children are taught to honor themselves, have compassion and be respectful of others, they will become global citizens who are productive and add value to this world.